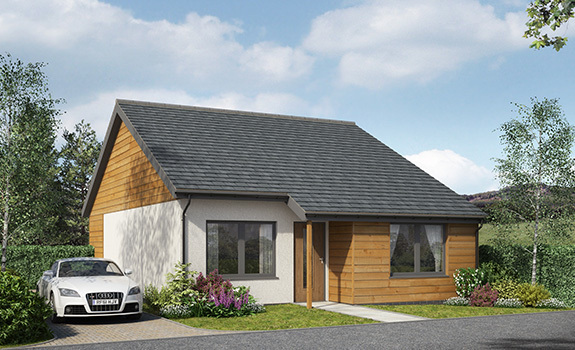 There are eco homes and there are eco homes………………..
What the market says and does. Energy efficiency, eco-credentials and sustainability are all terms that appear frequently in house builder’s marketing materials these days. Most volume builders will boast about their “units” being energy efficient or having eco credentials, but invariably such claims fail to stand up to scrutiny when you scratch beneath the surface. An example of this is the increased use of Air Source Heat Pumps (ASHP’s) by some of the volume builders. Whilst they are to be congratulated for taking this step, it is rarely taken for the right reason (ie it is usually because there are not adequate gas supplies in an area to allow traditional boiler solutions!). Volume builders will also tend to use heat pumps but without investing in improved building fabric, limiting the commercial value of this technology to their customers, as will become apparent in this blog. So how do Eskgrove differ from this? Eskgrove start with a basic recognition that what they are creating is someone’s home. To Eskgrove, it isn’t simply a cold, inanimate “unit” or a commodity on an accountant’s spreadsheet. To Eskgrove, they are creating the places that their customers will spend the majority of rest of their lives. As such, they want it to be as comfortable, healthy, easy to maintain and operate and with as low a running cost as possible. Eskgrove actually do want customer’s homes to be sustainable. The pragmatic approach to sustainability is to build homes in a way that requires less energy to run, rather than generate cheap energy on-site that you can afford to use more and more of. Sticking with the ASHP example, simply adding an ASHP to an existing house or just bolting one into an existing house design can be of a limited benefit. Having such mechanical plant working hard all the time because your house constantly demands more and more heat to maintain comfort, is a false economy. Rather, to maximise the benefit possible with use of an ASHP, the house itself has to be better constructed and specifically in a manner that avoids heat loss. So Eskgrove’s philosophy starts with the building fabric; ie what it is made from and how is it made. So how are standard industry houses and Eskgrove houses built? Timber frame is the dominant form of housebuilding in the northerly latitudes of world and Scotland is no exception in this regard. At its most basic, timber frame walls comprise timber studwork, fixed in place with sheets of plywood or, more usually, orientated strand board (OSB). The studs don’t tend to be particularly large and 38mm x 90mm is usually considered structurally adequate for two storey housing. Normally, these studs are combined into panels in a timber frame factory, with holes left for doors and windows to be fitted later, on site. When these skeletal panels have been erected on site, insulation is fitted, plasterboard is fitted, windows, doors and external finishes are fixed to the framing by a team of joiners, in-situ. The vast majority of timber frame housing is built in this way and is termed “open panel construction”. Eskgrove Homes are one of only a few companies in the UK to have developed timber frame systems to another level, into what is termed “closed panel construction”. This methodology, prevalent in Germany, Sweden and Switzerland, sees the walls of each house virtually finished in the factory. By finished, we mean that in the factory, the insulation, external wall cladding, doors, windows, service conduits and internal plasterboard are all assembled with the studs into complete panels – hence the term “closed panel construction”. Additionally, insulation standards for housing have rightfully increased in the past decade. It tends to be the thickness of wall insulation now which determines the depth of timber studs, with 140mm being more widely used. Eskgrove Homes actually utilise 180mm of insulation and correspondingly have deeper timber studs to contain it. By way of considering how the Eskgrove build method gives rise to better constructed, more energy efficient homes, as an example, we can consider how the windows and screens are installed. In standard modern house building, with open panel construction, windows are never fitted to precisely sized openings; rather they are located as best possible, then jammed into place with plastic packers of varying thicknesses and screwed to the timber studs top, bottom and each side. Usually the gaps around the window frames will be filled with some form of expanding foam, to varying degrees of success. From a structural engineering perspective, this method of fixing “works” but from an energy efficiency standpoint, windows installed in this way create a weak point and a clear route for heat loss. Conversely, the windows and glazed screens installed in Eskgrove’s homes are precisely manufactured. Supplied by German manufacturer Klienhans, they are specifically engineered with profiles to fit precisely into the wall panels, in a way that avoids cold bridges or gaps and thereby limiting heat loss. Painted in those terms, it is not difficult to understand which method is going to offer better, more consistent results. This is not an example that you will immediately register when looking at glossy images in sales brochures or indeed viewing a showhome. But, it is a very clear and pertinent example of just how much an Eskgrove Home differs in its construction from the “units” currently being offered in today’s volume housing market. So what about air tightness and its link to efficiency of your heat source? Put in its simplest of terms, if you put heat into a box full of holes, some of that heat disappears out through those holes. If you want to keep that box at a constant warm temperature, you have to keep putting more and more heat into it, to compensate for that you are losing through the holes. If your box is better made and has less holes in it, once you’ve heated it up, that’s it. After a while a small amount of that heat will of course leak out but it doesn’t take a big effort to replace it and get you back up to temperature. Now replace “box” with “your home” and “heat” with “energy costs” and you understand the significance of the analogy. Sure, you could use a cheap or renewable energy source but these still have a cost. If your box is full of holes, you are spending more than you need to, and you are wasting energy; that’s the opposite of having a sustainable home. Eskgrove can deliver houses to a range of air tightness, really depending on what the homeowner wants. Their first “right-size” home was built in the outskirts of Edinburgh for retired couple, Mr and Mrs Lamb. Their house was designed and built with exceptional air-tightness and balanced with mechanical ventilation that included a heat recovery system. Their heating and hot water are both generated using a modest Air Source Heat Pump. Coupled with underfloor heating throughout their home, the ASHP has a coefficient of efficiency that ranges from two to five, depending on the external temperature. In lay terms, this means that for every two to five units of energy you use, you only have to pay for one unit to generate them. The result of that is a warm, comfortable, three bedroom home for the Lambs, and a monthly direct debit for electricity in the order of twenty pounds! So their Eskgrove home needs only a small amount of energy to run and even that energy is efficiently generated. That’s sustainability and that’s a real Eco-home. The factory manufacture; the precisely engineered components; the detailing for air-tightness; the ASHP; the under floor heating; the mechanical ventilation with heat recovery. These are all parts of an interwoven and interdependent system of creating better, more sustainable homes. Sure, you can pick one or two of these items and patch them into your “unit” designs and claim to have sustainable credentials. But scratch beneath the surface and you begin to understand that it is just a patch. When you’ve done that scratching, take a good look at what Eskgrove Homes are doing and you will understand the both the difference and the value of investing in one of their properties.